Planning on developing a website? Well, a website is a great way to interact and communicate your existing and new customers and persuade them to choose you over your competitors. 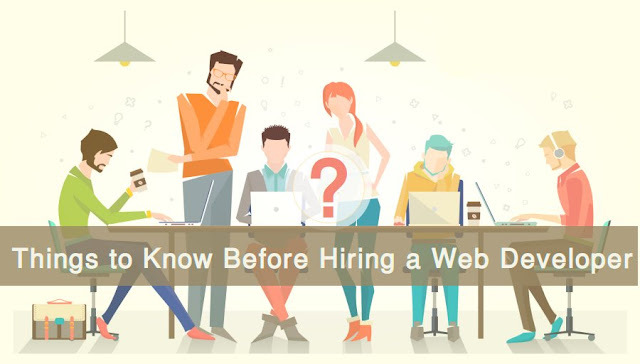 And if you are pretty serious about your decision and want to generate revenue from it, there are certain things you need to know before plunging into hiring a web developer for your project. Unless you are building a website to promote and advertise your bricks-and-mortar business, you need to have a robust business plan and a unique name for it. Of course, it is becoming quite common to build a website today but this does not mean you hire a web developer to get a website developed without having any business plan in mind. So before you get out there, make sure you have a business plan that will yield some revenue and profit for you. Once you have figured out your business plan, it's time to know what type of audience you want to target. I have seen many webmasters who do not have any knowledge of their audience even after getting the website developed and often end up with little to no results. I am sure you wouldn't want to be one of those webmasters. Thus does your homework before you hire a web developer to build a dynamic and fully functional website. According to a recent survey, it has been shown that more than 70 new domains are registered and 571 new sites are built every minute. And these numbers are growing every day. You have to understand that building a website is just a battle. The real war begins when you market your website. Website marketing comprises strategies and activities that result in ranking your website on the top pages of the search engine results page. Formulating a marketing strategy before getting a website developed can really help you get faster results in lesser time. Today where there is a website for almost everything – from shopping sites to educational institute. This means no matter what your business plan is, you are going to face a huge competition. And with so much competition in the marketplace, how are you going to attract visitors to your website? How do you intend to stand out from your competitors? How are you going to transmit your content to the potential audience at the perfect time? Your website needs to have certain goals to be accomplished. And then you have to prioritize your goals. Write down the three most important goals of your website and prioritize them accordingly. This is something that will help you draw in more prospects. Neither web designer nor web developer can help you understand this. It's your business and only you can explain why people should work with you and what makes you better than your competitors. So take you time and come with the best possible unique value proposition for your website and business. This may sound complicated to you, but it's not. All you have to do is know what type of structure you want for your website. Every web page of your website should have a proper layout and a purpose. Let's take this website as an example; the homepage has a small logo on the top left side with a simple and clear navigation bar in the header. The page layout has a top navigation, content area on the left side, a right sidebar and footer. Depending on the niche of the website, you can choose any type of layout you think will help you represent your business in a better way. What do you want your visitors to do when you land on your website? Do you want them to sign up for the newsletter, download an e-book, book a course, or make a purchase? How are you going to represent your CTAs on your website and what do you want these CTAs to say? For example, “Buy a product”, “Call Today”, “Request a Quote” or more. You also need to decide where you are going to place these CTAs. A majority of web experts recommend placing these CTAs above the fold to get more conversions. However, it still completely depends on you where you want to place your conversion elements. When you approach a web developer, you may get to hear tons of web terminologies such as user interface, user experience, navigation menu, website layout, or so much more. Thus to have a clear idea about what the developer is saying, you should get familiar with the basic terminology used in the online world. One of the most important things to ensure you has a successful online venture to decide on the right platform to power your website. Today, there are hundreds of different platforms available including various Content Management Systems that can be used to build your website without burning a hole in your pocket. You can consult some web experts on the internet to know which platform to choose. Once you have decided all the aforementioned things, it's time to set a budget for your project. Keeping in mind your website requirements and platform you are going to use, set a budget estimate that you will present to the potential developer. Remember there may be certain changes in the budget estimate after talking to professional and highly skilled developers. Getting a website developed can be an overwhelming process. However, if you know what you need from your website and developer, you can rest assured that your website will turn out to be a valuable asset. Also make sure your developer is highly professional, experienced and has worked on similar projects before to avoid ending up with a crappy website. You can also hire an experienced Wordpress developer for your Custom WordPress Website projects online.